The musical material for Canyon Echoes was inspired after a trip to the Grand Canyon. 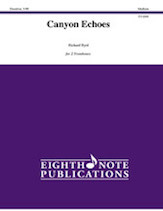 The open voicings of quartal harmonies reflect the canyon's vast expanse. This work is fun to perform and enjoyable to hear, and is ideal for competitions, conference preludes and engaging concert programs.